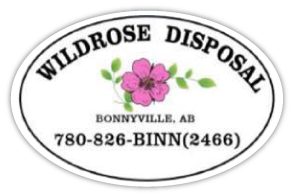 Family owned and locally operated by two brothers, Wildrose Disposal provides reliable and competitively priced recycling services and dumpster rentals in Bonnyville, Cold Lake, Cherry Grove and surrounding areas of Alberta. We live in the area, hire local employees and we believe in supporting the local community. We offer bins and dumpsters in a variety of sizes to fit your needs, from smaller, low-profile 4 and 6 cubic yard front-loader bins to large-capacity 20 and 30 cubic yard capacity roll-off bins. Rentals start at just $25 per month, and we will match all competitors’ prices for the same or similar services. Please browse our website to learn more about the products and services we offer and our commitment to customer satisfaction. To schedule a free quote at your worksite, home or business, please contact our office. We’re local people working for local people, the Local Garbage Guys.